Mean racist, kind racist, non-racist: which are you? “Race is real, race matters, and race is the foundation of identity.” I imagine that perhaps with a tweak or two, most people would be OK with this declaration. Many people are aware that the concept of race has no biological validity; that it’s a social construct, like gender or money, real only in that we treat them as real. Life in the modern era is total chaos. From the constant outbursts of sound, to the ubiquitous bombardment of advertisements, to the racing taxi cabs, cars, and buses, to the sheer swarms of people, even a simple stroll in the city can be massively taxing on your sensory system. You probably know about how important it is to donate food to your local soup kitchen during the holiday season (and the rest of the year, as well! ), but do you ever give much thought to what you’re donating? Do you ever give food you wouldn’t necessarily want to feed to your kids in large quantities? Completing multitudinous years of education presumably encourages people to juxtapose one esoteric word after another in order to fabricate convoluted paragraphs formulated of impressively, extensively elongated and erudite sentences. To put it another way: completing many years of education encourages people to write complex paragraphs full of long sentences composed of long words. Today, 10 October, is World Homeless Day. This day is dedicated to increasing awareness of the global issues surrounding homelessness, as well as getting people involved in their community to help meet the needs of homeless people locally. The increased publicity and solidarity of the global platform helps to strengthen grassroots campaigns at the most local level. The problems regarding homelessness are multifaceted. Teachers, administrators, and school social workers also prepare for a fresh start with new students and ideas to engage in another year of educational and developmental learning. Unfortunately, as the school year progresses, the new beginning and excitement can give way to complacency, frustration, and sometimes hopelessness. The reality for students who are disengaged from school, as well as those who experience significant academic and behavioral issues, is a season of uncertainty, diminished expectations, and possibly serious life outcomes that are just beginning. September is National Recovery Month in the US. Recovery Month is a time dedicated to increasing awareness and understanding of substance use and mental disorders. It’s also a time to celebrate those who are in recovery and those who do recover. The goal of the observance month is to educate others that addiction treatment and mental health services are effective, and that people can recover. With respect for this time, we compiled some statistics on addiction disorders to support awareness of these issues and show that individuals are not alone. From student presentations, to lectures, to reading assignments, and so much more, teachers today have a wide variety of methods at their disposal to facilitate learning in the classroom. For elementary school children, group work has been shown to be one strategy that is particularly effective. The peer-to-peer intervention supports children in developing cognitively, emotionally, behaviorally, and socially. Group work encourages children to expand their perspectives on the world. Today, September 21st, is the International Day of Peace. Established in 1981 by a unanimous United Nations resolution, International Peace Day “provides a globally shared date for all humanity to commit to Peace above all differences and to contribute to building a Culture of Peace.” To commemorate Peace Day and to encourage you to think more deeply about these issues, we’ve compiled a reading list of articles from the Oxford Research Encyclopedia of Latin American History, the Oxford Encyclopedia of American History, and the Encyclopedia of Social Work that explore peace movements, policies, strategies, and global issues. How can psychologists and other social scientists interested in making a difference become more fully and effectively engaged in the policy world? To address this question, in-depth interviews were conducted with 79 psychologists who were asked to describe their policy experiences over the course of their careers, with particular focus on a major policy success. Social workers regularly come into contact with those who are at risk of or exposed to suicide, through direct practice, as well as in family, group, and community roles. 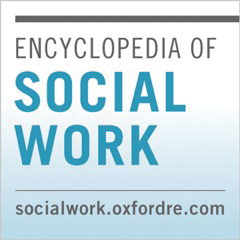 However, social work authors have been notably missing in the scholarly literature on suicide . Each year over one million people worldwide die by suicide. In the United States, approximately 42,000 people die by suicide each year, with a suicide occurring every 12.3 minutes. It is the 10th leading cause of death overall, and the 2nd leading cause of death for youth under the age of 24. For World Suicide Prevention Day, we’d like to tell you why this matters to us and why it should matter to you. Politicians are more than anxious over negative public opinion on the National Health Service, falling over backwards to say that the NHS is “safe in our hands.” Meanwhile, the Church of England is concerned about losing “market-share,” especially over conducting funerals. One way of linking these two extremely large British institutions is in terms of life-style choices.